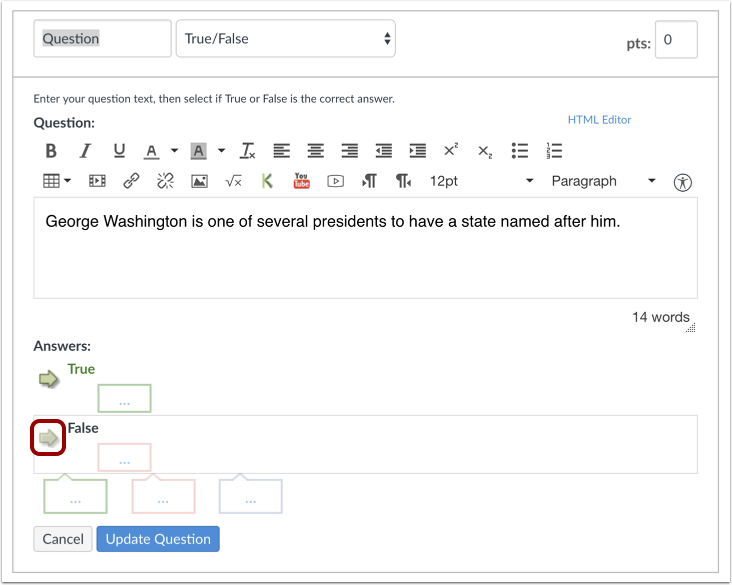 If you accidentally published a quiz with an existing true/false question that needs to be corrected, you can use quiz regrade to edit the question and update student grades. Learn more about quiz regrade options. Quiz regrade only applies to students who have already taken the quiz. 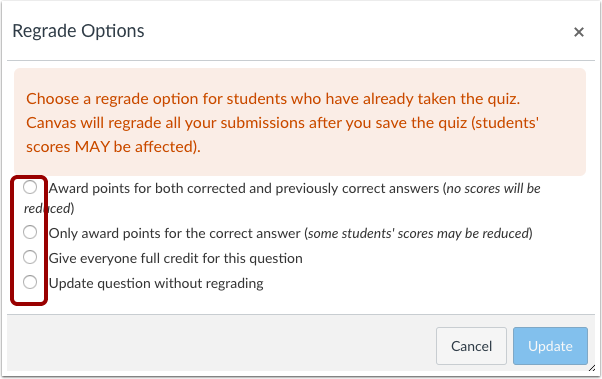 Adding or removing a question as well as changing the point value for the multiple choice question does not trigger the quiz regrade feature. Adding or deleting answers from a true/false question with submissions disables the option to regrade that question. 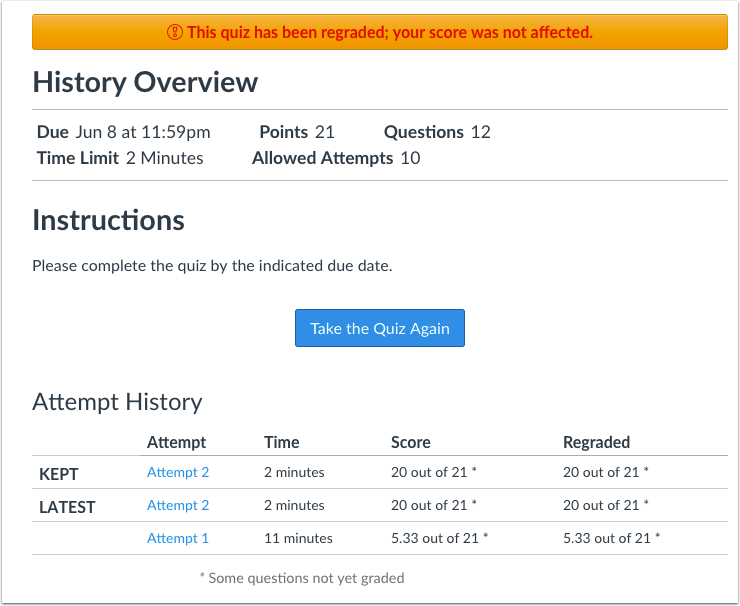 To regrade a quiz, in Course Navigation, click the Quizzes link. Find the quiz you want to regrade and click the Options icon , then click the Edit button . Locate the true/false question in the quiz. Hover over the question until the edit icon appears. Click the Edit icon. Hover over the answer you want to select as the new correct answer until a green ghost arrow appears. Click the green arrow to select the new answer as the correct answer. Canvas recognizes you have changed the correct answer for this question. In the regrade options dialog box, select a regrade option by clicking the radio button next to the option you want to apply to this quiz question. When you've finished editing your quiz, click the Save button. Note: Regrade options will not apply until you have re-saved the quiz. 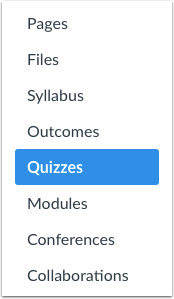 If you exit the quiz without saving, Canvas asks you to save your changes when you return to the quiz. To update your changes, click the Save It Now button. For help viewing or reverting grade changes in the Gradebook, visit the grading history lesson. When students view their quiz results, they see a notification if their quiz has been affected. The attempt history also reflects the regraded score. Previous Topic:How do I regrade a Multiple Choice quiz question? Next Topic:How do I regrade a Multiple Answers quiz question? Table of Contents > Quizzes > How do I regrade a True/False quiz question?